John Tyler bought this 1,200-acre plantation in 1842, when he was still serving as 10th president of the United States, and it was his retirement home from 1845 until his death in 1862. He expanded the original 1780 frame plantation house into one of the longest private residences in Virginia—300 feet long but only one room deep. Tyler was the first vice president of the United States to succeed to the presidency and set an important precedent by claiming the full powers of that position. His major goal as president was the annexation of Texas, which occurred shortly after he left office. Expelled from the Whig Party that nominated him, he was the first president threatened with impeachment. He named his plantation “Sherwood Forest” because he considered himself a political outlaw—like Robin Hood. John Tyler was born in 1790 at Greenway plantation, only about three miles away from Sherwood Forest. He studied law and soon entered politics, serving in the Virginia legislature from 1811 to 1816. Elected to the United States House of Representative in 1816 as a Democratic Republican, he supported the proslavery, strict constructionist, and states’ right positions that he would hold to for the rest of his career. After leaving the House, he returned to state politics, serving as governor from 1825-1827. Elected to the United States Senate in 1827, he backed Andrew Jackson for president but became increasingly dissatisfied with his policies. By 1836, he abandoned the Democratic Republican Party, resigning from the Senate and becoming at least a nominal Whig, though here again he disagreed with many of the party’s policies. The Whig Party nominated him for vice president in 1840, with William Henry Harrison, to appeal to states’ rights southerners. The pair known as “Tippecanoe and Tyler too” shared a short time in office together. Harrison caught pneumonia on Inauguration Day and died a month later. Tyler was only 51, the youngest president ever up to that point. Tyler was also the first vice president to reach the presidency. Although called “His Accidency” by his opponents, he refused to serve as acting president, insisting on all the powers of a duly elected chief executive. Because he opposed many of the policies of the party that nominated him, his administration was an intensely controversial one. He vetoed many bills enacted by the congressional majority and was the first president ever to have his veto overridden. At one point, all but one of his cabinet members resigned. The Whigs expelled him from the party and considered impeachment, again for the first time. They pushed through a resolution of censure in the House of Representatives and even denied him money to maintain the White House. Letitia Christian Tyler, the President's first wife, died in the White House in September 1842. A few months later, Tyler began courting 23-year-old Julia Gardiner, a beautiful and wealthy New Yorker. Their marriage in New York City on June 26, 1844, marked another first, the first president married while in office. Tyler’s administration managed to accomplish a great deal in spite of its political difficulties. It settled a long-standing dispute over the boundary between the United States and Canada and signed the first commercial treaty with China. It reorganized the United States Navy, established the Weather Bureau, and ended the Seminole War. Tyler’s last and probably most important achievement was to facilitate the annexation of Texas. At the very end of his term, Congress passed a resolution offering Texas the opportunity to join the Union. In 1844, Tyler threw his support to James K. Polk, the Democratic nominee, and retired to Sherwood Forest. By this time, Tyler had already expanded the original plantation house. One and one-half story wings already existed on either side of the two and one-half-story main block. He added a covered hyphen to connect the east wing with an existing kitchen and laundry and built a new balancing west wing containing an office and ballroom, reportedly designed by Tyler for dancing the Virginia reel. The two wings created a long narrow house with a unified, symmetrical façade. The interior displays ornamental woodwork based on the pattern-book designs of Minard Lefever and fashionable Greek Revival details. Remnants of the terraced gardens and lawns reportedly designed by New York landscape architect Andrew Jackson Downing survive on the 25-acre property. There are also over 80 varieties of trees including a gingko tree given to Tyler by Captain Matthew Perry, when he returned from the Orient in the 1850s. Tyler concentrated on managing his plantation and raising his second family in the 1850s. In 1860, hoping to avoid a civil war, he worked to find a compromise. He presided over the Washington Peace Convention of 1861, but when this failed, he voted for secession at the Virginia Secession Convention. Elected to the Confederate Congress, Tyler died on January 18, 1862, before it assembled. During the Civil War, Tyler’s widow and children left the estate to live with her family in New York. Following the war, Tyler's wife returned to Sherwood Forest to reclaim the plantation. Sherwood Forest has been the continuous residence of members of the Tyler family since President Tyler purchased it in 1842. 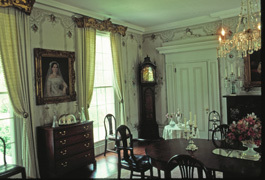 Restored in the 1970s, the house reflects the lifestyle of this mid-19th century presidential family. The John Tyler Home, Sherwood Forest, at 14501 John Tyler Memorial Hwy., Charles City, VA has been designated a National Historic Landmark. Click here for the National Historic Landmark registration file: text and photos. The house is located 18 miles west of Williamsburg and 35 miles east of Richmond on Virginia Rte. 5. The grounds are open daily for self-guided tours from 9:00am to 5:00pm. Guided house tours are available by appointment. There is a fee for admission. Please call 804-829-5377 or visit the Sherwood Forest website. 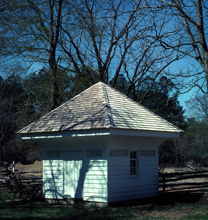 Sherwood Forest has been documented by the National Park Service's Historic American Buildings Survey. The John Tyler Home is also featured in the National Park Service James River Plantations Travel Itinerary.